U.S. women’s national team star Megan Rapinoe knelt down during the national anthem before a club match Sunday evening, a gesture she said was in solidarity with NFL quarterback Colin Kaepernick and other athletes who have refused to stand for the anthem. The protest occurred as Rapinoe and the Seattle Reign team prepared to take on the Chicago Red Stars in Bridgeview, Illinois, for a match with important playoffs implications for both teams in the National Women’s Soccer League. After the 2-2 draw, Rapinoe told reporters she did it in solidarity with Kaepernick, who has said he is protesting "a country that oppresses black people and people of color." While he has received support from some fellow athletes and his jersey sales have increased, some detractors have called his gesture unpatriotic. Rapinoe added that as an openly gay athlete, she understood where Kaepernick was coming from. "And quite honestly being gay, I have stood with my hand over my heart during the national anthem and felt like I haven’t had my liberties protected, so I can absolutely sympathize with that feeling,” she told ESPNw. Kaepernick started his protest last month during the NFL preseason and since then, several NFL players have joined in the protest, opting to sit or kneel during the Star-Spangled Banner. He has specifically highlighted police brutality against minorities as a reason for the protests. Rapinoe said she intends to continue her protest for anthems going forward. 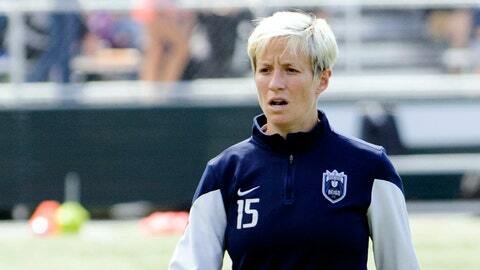 The Seattle Reign and Rapinoe return to action Wednesday night when they face the Washington Spirit. The Chicago Red Stars, meanwhile, will face FC Kansas City on Wednesday at 8 p.m. ET on FS1. The USWNT plays again on Sept. 15 against Thailand.